Cartooning videos like the samples here, are a great way for cartoonists like myself to present their cartoon style for review. 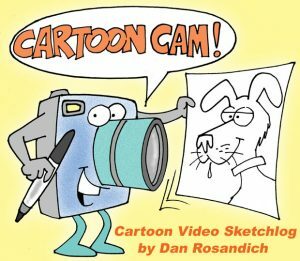 On this site I’ve designated a page that offers visitors my freehand sketching cartoonist videos where I’ll quickly sketch a panel cartoon, gag cartoon, face or people. Simple Freehand Cartoon Sketched From Beginning To End With Basic Marker from Dan Rosandich on Vimeo. If creative directors seek similar images or need something for white boarding, contact me at my email address in the contact form at the top of my page. This collection will also act as a cartoon portfolio of sorts where I’ll show the finished art that’s sometimes colorized in Photoshop. There are a lot of video editing programs which a cartoonist can download and install for editing similar videos like I am providing on this page. A simple web cam can do the trick, and what I had done to achieve what is displayed here, is to draw my cartoons freehand while making the actual video and saving it on my hard drive. I then took the final art and colorized that and saved it in a designated folder on my system and used that final color cartoon as the actual “introductory” image. 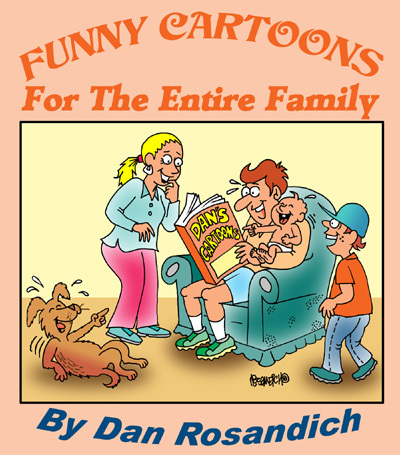 Coloring cartoons becomes second nature to cartoonists using programs like Photoshop if they use it long enough. To get the introductory text overlapping the color cartoon when the video starts was also done by me in the video editing software I used. I could provide you with the editing software, but that doesn’t matter. If you want to make similar cartooning videos, it’s easy. To find what is called editing software, do a search for “video editing freeware” and I think you’ll be presented with a wide offering of programs to choose from. Believe me, they’re not difficult to learn….some are very intuitive if you decide to make a video like this but by all means, contact me with any questions about this and use my contact form or my business email address that’s on the same page. I’ll do all I can to offer insights about this unique way of using cartooning videos to promote your cartoons and illustration services.